Not all are equal. Not all are Free. Wait – have I read this before? 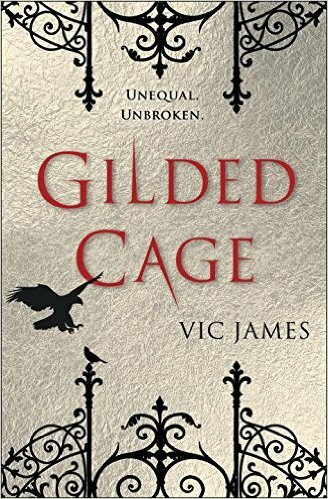 Vic James’ debut novel, Gilded Cage, proffers up an alternate Great Britain with all the makings of a dystopian society comprised of an elite ruling class of magic wielding aristocrats who use their “Skill” to keep their skill less counterparts – the commoners of England under control. As a means to maintain their power and infrastructure of their world, the Skilled require that all commoners serve in slavery for ten years of their lives. The Hadley family is beginning their slavedays and will be sent to serve their ten-year sentence at the estate of the highly powerful Jardine family, Kyneston instead of the slavetown of Millmoore. When Luke Hadley is reassigned to Millmoore instead of joining his family at Kyneston he befriends a ragtag group of rebels who are set on undermining the Skilled and ultimately abolishing slavery in Great Britain. It should. Two groups battling for power and equality, where the oppressors are able to use their magical abilities to keep everyone in check? I believe I have read this before, a few times, actually. The writing is easy to read and follow. I think that this will make the reader more likely to finish the book and stay with the story. There are multiple points of view. The reader is able to get into the heads of various characters, skilled and non-skilled. This mechanism works for the most part, but I really wish that the author had focused on only those who were pivotal to the storyline. Luke, Silyen and Abi were probably the best developed – but I would like to see emotional growth from all three in the next two books. Magical abilities and interesting sub plots. I love the magical abilities of the skilled characters and I found the history of these people to be very interesting – I hope Vic James elaborates on this as the series goes on. Moreover, I just really want to know more about Silyen’s abilities. I won’t lie, he’s the only character keeping me interested at this point. The Cliffhanger! For me, it took a lot of time to get to a place where I began to invest myself in the characters and the plot of this story. The cliffhanger at the end should bait readers for the next two installments. Overall, I found the book to be unremarkable garnering it a three star average rating from me. I would like to see a more fluid, better developed second and third installment to the series. For a first book, this works well for the genre and audience intended and I would recommend it to upper middle graders and younger high school students. Gilded Cage is available on February 14, 2017. Thank you NetGalley for providing a free Ebook for me to review!